The inspiration for this jaw-dropping rustic shelf happened during a recent hunting trip in Tennessee. While we were there, I couldn’t help but notice how beautiful the scenery was looking down the valley. From the rolling mountains, blue mist and the rugged landscape which was filled with some of the most majestic pine trees I have ever seen. 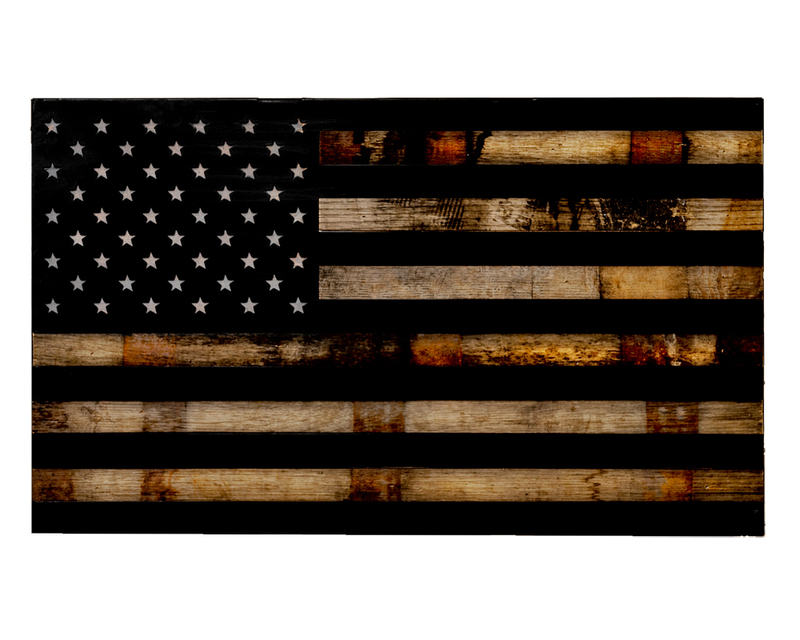 And because the majority of our customers love the outdoors like us, we decided to make a limited edition concealment shelf that celebrates the great outdoors and the American way of life. 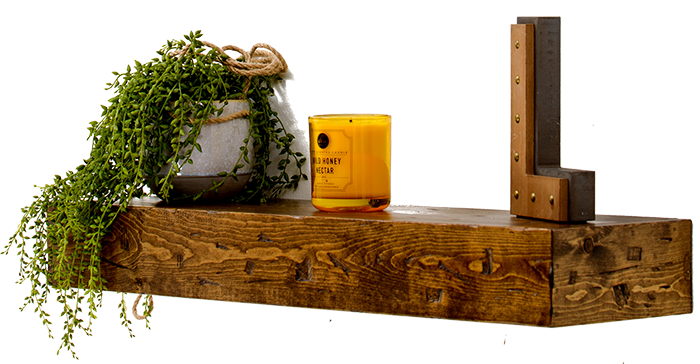 This rustic shelf is made from knotty white pine... the best we can find. Then we hand-distress it the old-fashioned way, preserving the natural wood grain and knots, so each shelf is its own unique work of art. No one would ever guess this incredible shelf secretly and securely stores your firearms, and gives you instant access when you need them. The Liberty 35S somehow manages to blend high-end luxury with the rugged outdoors in a way we've never seen before! If you're like most of us, you probably keep your home defense weapon in a safe… usually, in your master bedroom closet. Nothing wrong with that except what if you need to quickly access it to protect your family or home? By the time you make your way to the safe and unlock (in the dark)... you're already too late. In fact many experts believe if you can’t get to your gun within 10-15 seconds there’s no point of having it around as home defense weapon. In order to effectively protect yourself, family and property you need to be able to get to your weapon in seconds. This is why we created the Special Edition Liberty 35s. 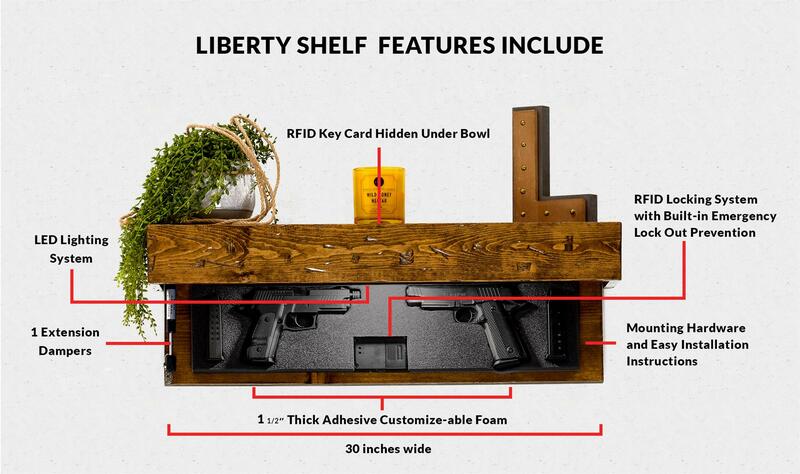 The Liberty 35s is a free floating real wood shelf… equipped with a secret "locking" trap door that quickly and easily conceals and locks your guns, magazines or even valuables in plain sight in anywhere in your house. The Liberty 35s looks like an ordinary high end wall shelf so it dresses up any room you put it in. However, the magic behind it is its secret trap door that stays LOCKED and SECURE under a state of the art RFID locking system. There are no combinations to memorize (which will be easily forgotten in a red alert situation) or buttons to push. Instead, you simply place the included RFID card, key fob, or token on the top of the shelf and, like magic, it opens in less than 1 second, reveling a high-density foam lined cavity holding your firearms. With this RFID locking system you’ll have peace of mind knowing your gun is secure and hidden, yet can be accessed when you need it in seconds. When Joe and I first started building concealment shelves our main goal was home security. However, in time we started creating different models for customers who want something really unique… something with a story behind it. For example, the inspiration for the Liberty 35s took place a few months ago on a hunting trip in Tennessee. While we were on our hunt I couldn’t help but notice how beautiful the scenery was looking down the valley. From the rolling mountains, blue mist and the rugged landscape which was filled some of the most majestic pine trees I have ever seen. On our way back to the cabin down this 4 mile dirt road, my warehouse manager, Jeremy, looks over to me and says "Joe, I've been inspired." He said the majority of our customers love the outdoors like us, so why not make a limited edition concealment shelf that celebrates the great outdoors and the American way of life. 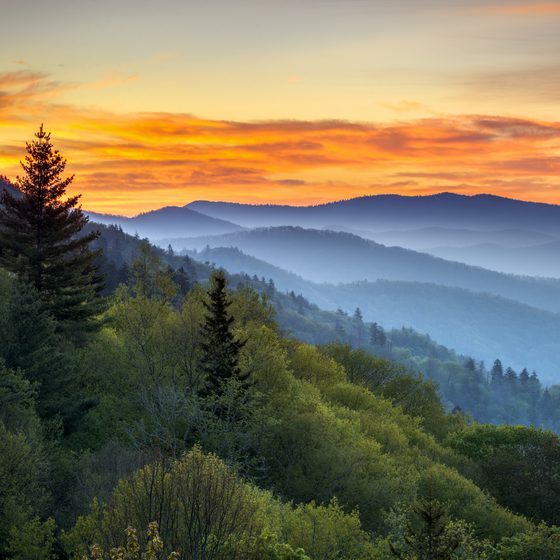 He said, "We could make the shelf out of solid white pine timber just like them trees you and I saw in the valley. We could hand distress it and give it that reclaimed wood look everyone wants nowadays. And we could hand rub the finish to capture the natural grain and knots so that each shelf is its own work of art." 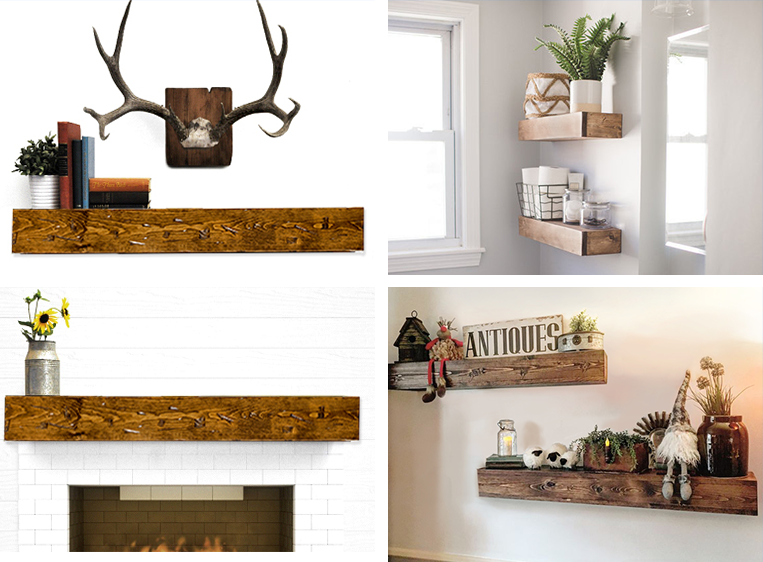 Not only would a shelf like that look amazing in a log cabin or farmhouse… it would also look great in a modern home too because that reclaimed/rustic look is the hottest trend in interior design today. 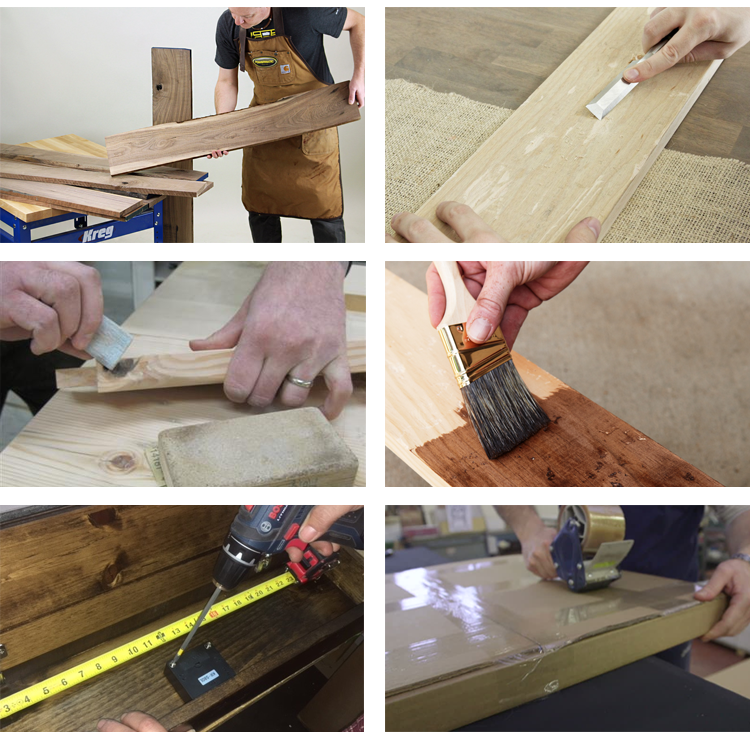 Every piece of wood we use on your shelf is hand selected by our master carpenters and cut to the precise tolerances by hand. It is then distressed, the old fashioned way, with a chisel by one of our master carpenters giving it a one of kind reclaimed wood look that no machine can replicate. Finally, each shelf is sanded and stained by hand carefully making sure the natural beauty of the grain shows without being blotchy. This gives it a rustic feel but with high end looks. It’s truly an art form which is why you will never see a product of this quality sold in Wal-Mart or Target. Best of all, it’s functional… no one will ever suspect you have your guns hidden inside. Take a look at the picture below… it’s virtually impossible to see the secret trap door with two hidden pistols inside! The Liberty 35s comes with a customizable foam pad that is to be trimmed to fit your weapon as well as a special quick draw magnet that will hold in place. Simply place your gear on top of the foam however you want to display it. With a handheld razor, cut around your weapon, your optics and your magazines, whatever, and peel away excess foam. Your firearm will snug safely and securely into place. The foam and included quick draw magnet will hold your gun safely in the case. 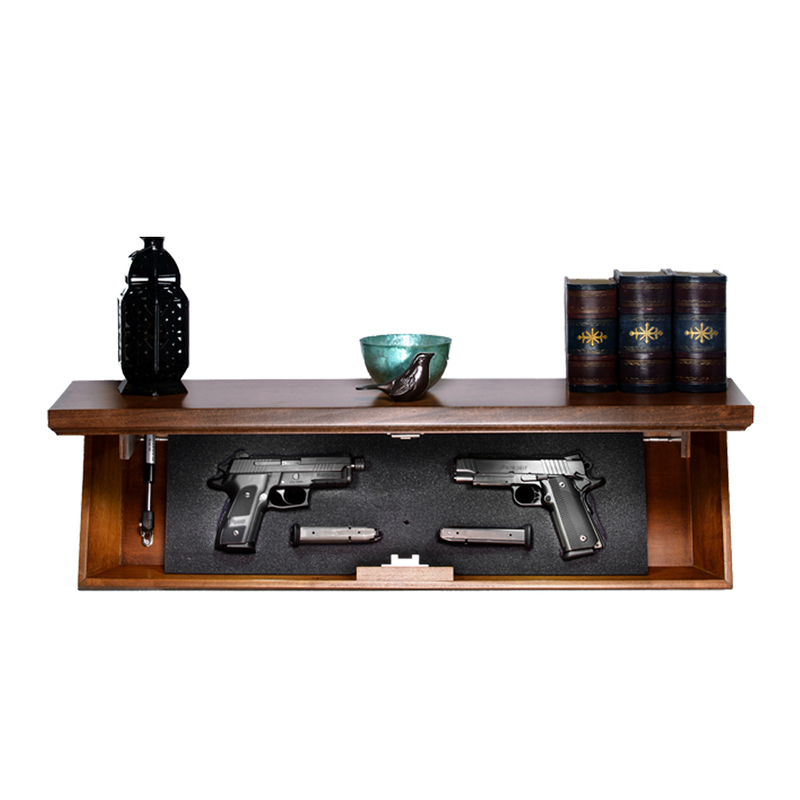 You can easily fit two full handguns beautifully displayed as well as some magazines. In the picture below I've got a Para Black Ops .45, Sig dark elite p229 and two magazines. The Liberty 35s is designed to work easily with standard 2x4 construction... so it can be safely and securely mounted on any wall in any home or apartment. You don’t have to do any custom work to the wall... no additional supports and there’s no sheetrock cutting or anything like that. Just open up the box and screw it to your wall. It will take 10 minutes or so to install it... and the hardest thing you may experience while installing a Liberty 35s is what wall to put it on. That’s why many of our customers buy 2, 3 and even 4 at one time! The Liberty 35s measures 30” wide and 8” deep. It’s a perfect size to place in a foyer, hallway, living room, bathroom, home office or just about anywhere. You can get the Liberty 35s in any of these six wood stains: Dark Walnut (color featured in these pictures), Rustic Maple, Midnight Black, Distressed Gray, Country Pine, and Unfinished ( no stain but still distressed). If for any reason you are not completely thrilled with the appearance, the quality, or the usefulness of your new Tactical Trap... just let us know and you can get a full refund.